The Rev. 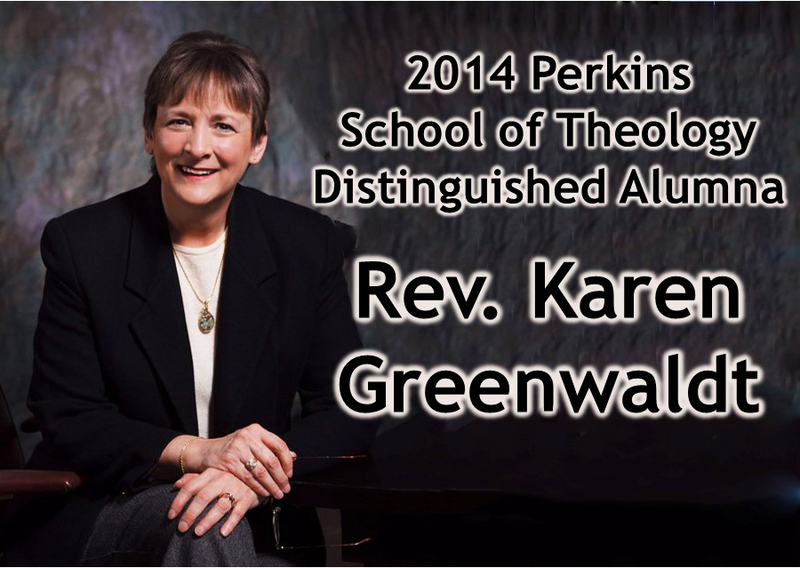 Karen Greenwaldt, General Secretary of the United Methodist General Board of Discipleship (GBOD) from 2001–2013, has been named the 2014 Perkins School of Theology Distinguished Alumna. A clergy member of the Central Texas Conference, Rev. Greenwaldt earned the Master of Theology degree from Perkins in 1977. The Distinguished Alumna Award will be presented at 6 p.m., Monday, Feb. 3, during a banquet as part of Perkins School of Theology’s Ministers Week. The annual Distinguished Alumnus/a Awards recognize Perkins graduates who have demonstrated effectiveness and integrity in service to the church, continuing support and involvement in the goals of Perkins School of Theology and SMU, distinguished service in the wider community, and exemplary character. Rev. Greenwaldt served as General Secretary of the GBOD from her election in 2001 through her retirement last month. GBOD is one of 13 councils, boards and commissions that carry out the work of The United Methodist Church. As General Secretary, Greenwaldt served as chief executive officer of an organization tasked with providing training, support and resources for clergy and laity leaders in the areas of spiritual growth and development, devotional literature, curriculum resources, Christian education, evangelism, worship, stewardship and ministry of the laity in a global denomination numbering approximately 12 million members. Rev. Greenwaldt first came to the General Board of Discipleship as an elected member of the GBOD’s Board of Directors from 1980–1981. She joined the GBOD staff in September 1981, serving as Director of Church Leader Development and Director of Education and Ministries with Young Adults and Single Adults, and later as Associate General Secretary, Administrator and Team Leader of the Discipleship Ministries Division. Before serving with GBOD, Rev. Greenwaldt was the Associate Council Director for the Central Texas Conference. She also served as an associate pastor and a hospital chaplain. Prior to earning the Master of Theology degree from Perkins School of Theology, Rev. Greenwaldt received her B.S. from McMurry University, Abilene, Texas. She is author of Singles Care One for Another, For Everything There is a Season, and Organizing in the Small Membership Church, as well as numerous articles on the vision and mission of the church. Rev. Greenwaldt is married to Russell Harris, a full-time studio potter. They are active members of their local United Methodist congregation. Tickets for the Distinguished Alumna Award Banquet are available for $49 each by registering at regonline.com/mw2013. The banquet will be held in the Great Hall of Elizabeth Perkins Prothro Hall on the campus of Southern Methodist University. For more information about reservations for the banquet or about Perkins School of Theology Ministers Week, contact Pam Goolsby, associate director of Continuing Education at 214-768-2251 or pgoolsby@smu.edu. For more information about the Perkins School of Theology Distinguished Alumnus/a Award or this year’s recipient, contact the Office of Public Affairs, 214-768-1393, tmclemore@smu.edu.